Aggregate, on a metallic matrix, of cuboctahedral crystals with very well defined faces and edges in which the forms of the cube and the octahedron have an equal size. It is from a find by Frank de Wit in 2007 from which we offer all of the available samples. The piece is with a label signed by Frank that we'll send to the buyer. 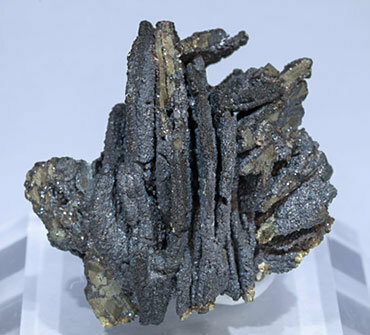 This specimen was published on the Mineralogical Record´s web page, in the ‘What’s New in the Mineral World?’ section, report #30, November 25, 2011 edition. 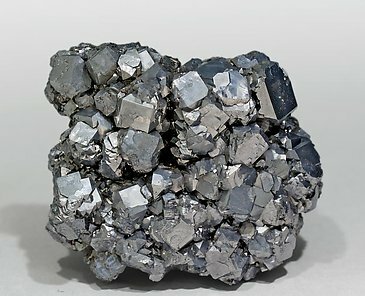 Group of very bright cuboctohedral crystals of Galena that have polycrystalline and partially skeletal growths. An American classic. Fine “oldie” with a group of cube-octahedral crystals on matrix, some of them with very well marked spinel law twins, that display a good luster considering it is an ancient sample from a classic locality. The piece is from the collection of John Marshall. The collection card is lost, but the pedigree remains testified by the number of small labels on the back side. 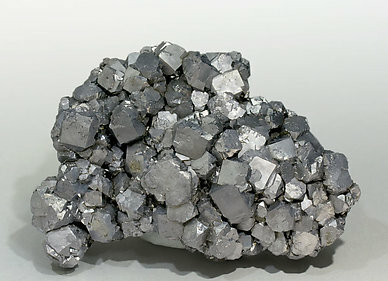 Group of cubic crystals of Galena, some of them flattened and have a tabular aspect. They have the vertices truncated by the triangular faces of the octahedron. On the lower side there is a small, very well defined, crystal of Sphalerite which color is honey yellow. A photograph of this specimen is on the page 207 of the book "Earth Science" (4th edition) published by BJU. 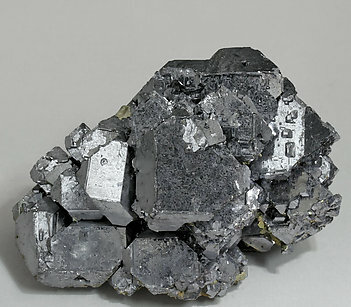 Group of very sharp thick tabular Galena crystals with a very well defined pseudohexagonal contour because they are pseudomorphous after Pyrrhotite. They are partially coated by a second generation of well defined galena crystals and small groups of micro-crystalline Quartz. 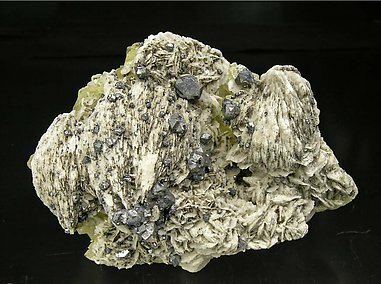 These pseudomorphs of Pyrrhotite-Galena from Murcia are well known for their stability so they are not altered by time. 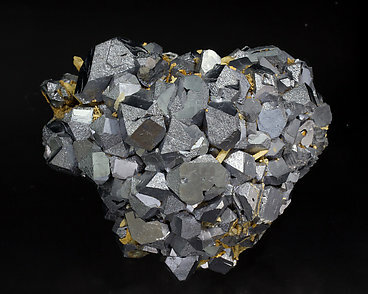 A sample that reclaims a special attention, both for its spectacular appearance and for its complexity, because the Galena has the pseudomorph shape of parallel growths of old tabular Pyrrhotite crystals coated by Pyrite further recrystallized in small cubic and cubo-octahedral crystals, and with some twinned Sphalerite crystals. 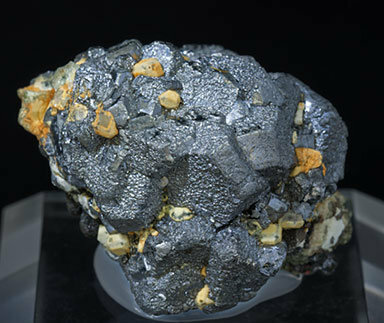 Being that the Pyrrhotite is after Galena and not Pyrite (which is the the most typical) the chemical stability of the sample seems assured. 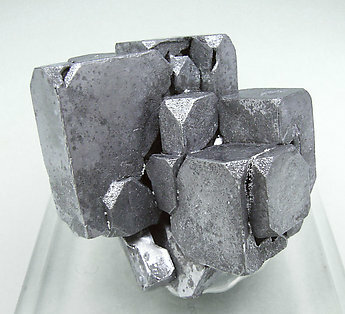 Group of cubo-octahedral crystals of Galena showing smooth and bright cube faces that contrast with those of the octahedron, which have a rougher surface. They are with small crystals of Quartz and on matrix, with Sphalerite. From a locality that used to be very productive (although it is no longer so) this one stands out from all the others found there for various reasons: the form of the crystal (slightly oblong and with small octahedral modification on the corners), all the faces are undamaged, the brilliance of the faces, and, above all, its great position on the matrix of botryoidal Pyrite. So while many Galenas have been found in the Tri-State district this one is special. 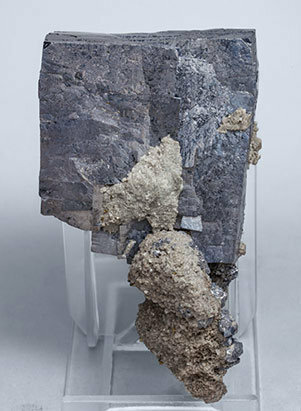 Small crystals of Galena with very well defined faces and edges, forming the twin following the spinel law on a matrix of so called “book” aggregates of white Baryte crystals and with cubic yellow, transparent and bright crystals of Fluorite. An European classic. 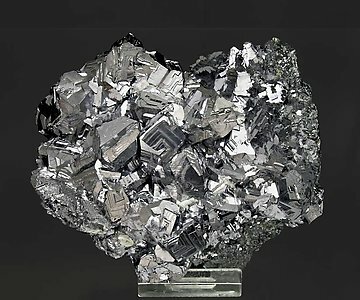 Parallel growths of cuboctahedral crystals of Galena that are extraordinarily bright, especially bearing in mind that they are from Romania. Some of them show skeletal growths, and with white lenticular crystals of Calcite and small crystals of Siderite and Pyrite. 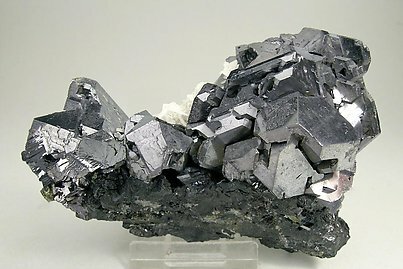 Group of very sharp cubo-octahedral Galena crystals with a good size, with very well defined faces and edges, bright and partially coated by Calcite and Quartz crystals and small Chalcopyrite crystals. Very sharp and aerial Galena crystals, one of them clearly dominant. They are cubic with small octahedral faces, and are on matrix with small white Dolomite rhombohedra and twinned Chalcopyrite crystals. The sample is from the Carles Millán collection whose catalog card we’ll send to the buyer. 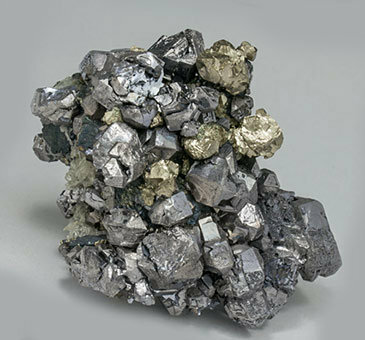 Aggregate, on a metallic matrix, of cuboctahedral crystals with very well defined faces and edges in which the forms of the cube and the octahedron have a very equal size A thin film of Pyrite coats some of the crystals of Galena. It is from a find by Frank de Wit in 2007 from which we offer all the available samples. The piece is with a label signed by Frank that we'll send to the buyer. A classic species, with the classic cuboctahedral form and from a classic locality. It started as a cube and then later on cuboctahedral forms grew on it, orientated to the cube. All of which makes the specimen especially attractive. 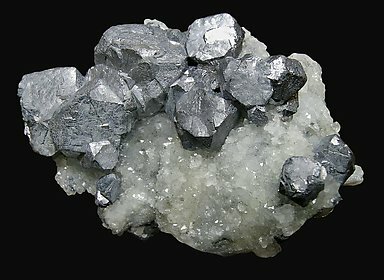 Cubo-octahedral Galena crystals with hoppered growths in some of their faces. 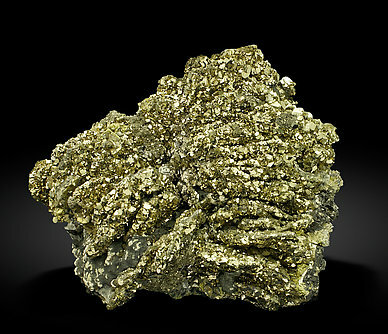 They are bright and are on matrix, with Pyrite aggregates and small Baryte crystals. 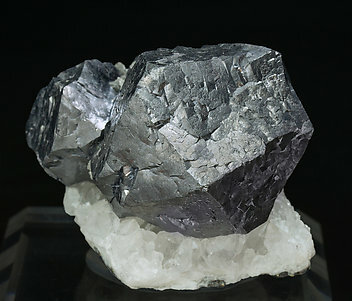 The quality of the Galena is better than usual for the locality. 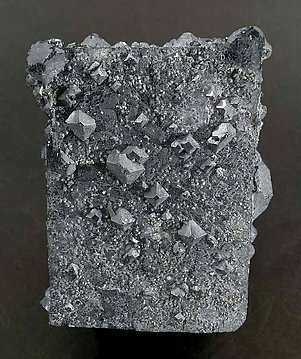 Aggregate of bright cubo-octahedral Galena crystals unusually well developed that have a large size for the locality. 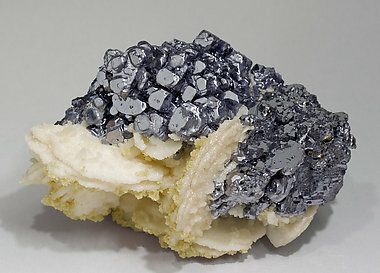 They are with small Calcite crystals and are on matrix, with Chalcopyrite. 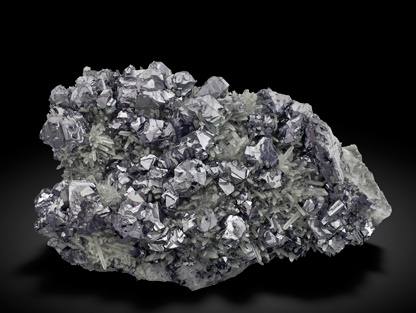 Galena is a very rare species at Panasqueira, especially forming such well defined crystals. 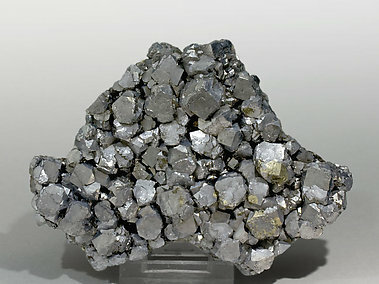 Very sharp and bright cubo-octahedral Galena crystals on a matrix of small Pyrite crystals, with white Calcite. 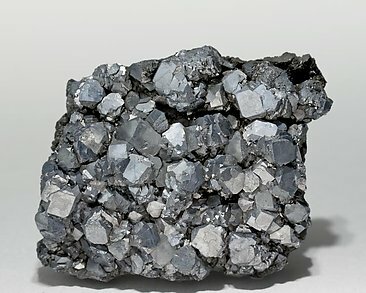 The Pyrite aggregate has a curious hood-like shape that probably corresponds to the surface of an old lost scalenohedral Calcite crystal. Cubo-octahedral Galena crystal showing an equal development of the cube and the octahedron faces. 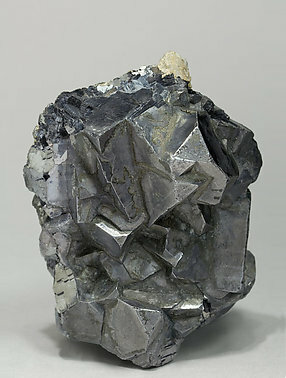 One of the cube faces is coated by a grayish-yellow Pyrite crust and the crystal is with white small Fluorite crystals. 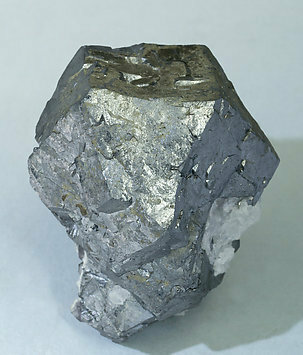 The Galena crystal is very well defined, more so than usual in the samples from this area. 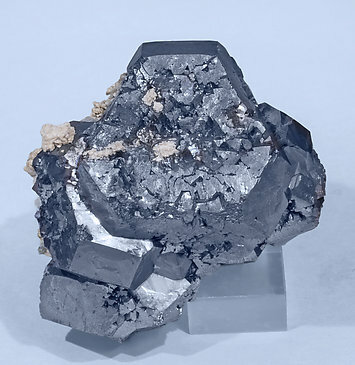 The well known aesthetics of the Kosovar samples enhance some minerals that are currently considered as “modest,” as is the case with this Galena that forms cubo-octahedral crystals that are twinned according to the spinel-law, some of them flattened, all them extraordinarily bright and on matrix with Quartz crystals. Group of cuboctahedral crystals with a very well defined spinel law twin and with small and thin crystals of frosted Quartz. The piece resembles those from Dalnegorsk but it is from the famous Bulgarian mining area of Madan. A classic actually really difficult to obtain. Crystals are formed by faces of cube and octahedron and they are preserved exceptionally bright on the matrix of small Quartz crystals. The specimen is with an old label from an unspecified collection. Group of cubo-octahedral crystals with very well defined faces and edges and showing polycrystalline growths on the surfaces. They are on a matrix of Quartz crystals and partially coated by micro-crystalline aggregates of this same mineral. An excellent English classic, from a very well-known locality. 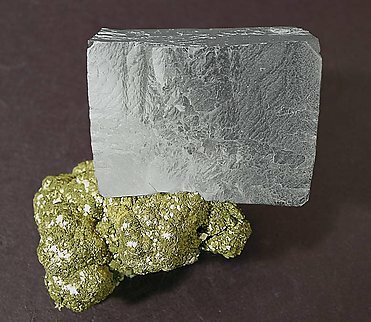 Group of cubic Galena crystals with excellent luster and showing well marked growth striations on the cube faces. Also with very visible spinel twins. 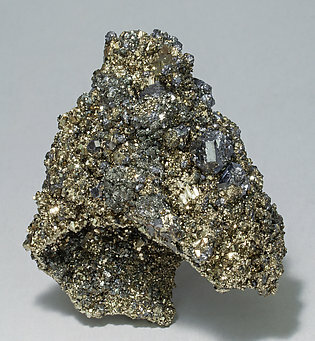 There are Chalcopyrite and small Quartz crystals at the rear of the specimen.